This past Saturday August 9th I auditioned for the popular Fox Television show American Idol. I woke up at 6:00 AM put my wig on and started preparing for a monumental moment. Above is a video of me preparing for my big break. I arrived at the Auditions and there were already about 50 people in line. As time went on more people began to show up. My Friend Wilma was a good sport and came out to support me and ended up waiting an hour outside while I was in a waiting room with 50 other people waiting to perform in front of a panel of judges. All of us in the room were very supportive of each other. There were a group of girls who came together to audition who really got the group going. One girl got up and sang Britney Spears Oops I did it again just for fun. When I went in to the audition I was asked a few questions. One was "Who are you supposed to be? Hannah Montana?" I replied "Yes" They then asked "Will you be singing one of her songs" I replied "No I'm not a fan of her music I will be singing Rick Astley "Never Gonna Give You Up". I then proceeded to Rick Roll the judges (Dee, one of the judges, could barely keep her composure). The guy running the computer in the back did the dance and well mostly I got a lot of snickers and laughs. When i finished my piece they asked me to sing a different song. I asked "Why? do you not like Rick Astley" One of the judges replied "No..." I was trying so hard not to burst out laughing. They asked me to sing the National Anthem so I did and half way through I messed up because I was so thrown off about the one judge not being wild about Rick Astley. I left the Auditions and gave the mean girl out side a quick interview. Then got photographed and Interviewed by the Clarion Ledger with Wilma, and later ended up at McDonalds. It was a great experience and I am very thankful I did not get called back. 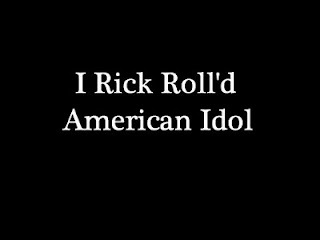 I think having to travel to Round 2 just to Rick Roll a bunch of people would have just not been the same as Surprising Dee and Rick Rolling her. And no I'm not actually a huge fan of the show nor was I hoping to move on to the next round in reality. And I wrote this half asleep. Can you tell? ha! It turns out the person that won the big trip up to Jersey for the big Auditions was one of my little brothers friends. I'm so excited for him and I hope he goes all the way!!!!! Good Luck Spencer!